THE DARKNESS ROLLING. Win & Meredith Blevins. Forge. This historical mystery has it all: adventure, romance, mystery – all cloaked in the cinematic territory of the American Southwest. The novel tells the story of seaman Yazzie Goldman, who returns home from World War II to find his world permanently changed. But even though Yazzie Goldman has returned home, the war is hardly over for him. Now, he and his family are pursued by Zopilote the human buzzard who vows revenge at the elder Goldmans who helped jail him. 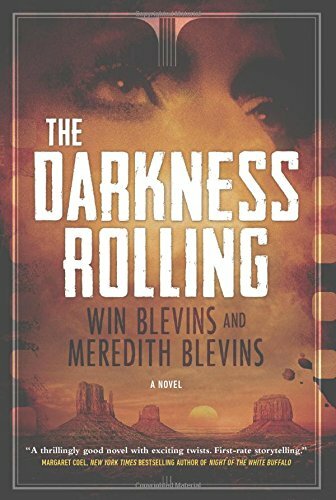 The Darkness Rolling is a thrill-a-page novel that unfolds like the shape of a movie – moments of love and vengeance, of hope and rage, forever intertwined. The writing here is a true celebration for the senses – rich and evocative, building characters that consume the consciousness and pull us ever closer to them. This is one for the summer season that shouldn’t be missed. BLOOD OF THE COSMOS. Kevin Anderson. Tor. 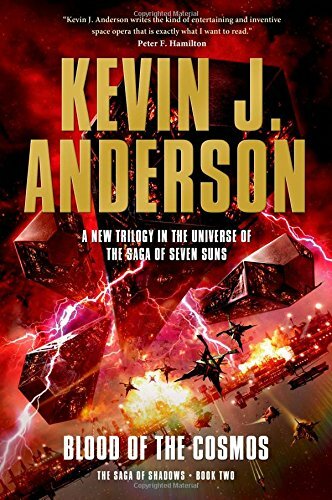 This is the second installment of Anderson’s The Saga of Shadows series, taking off from the ending point of The Dark Between the Stars. The story features the Humans and Ildrians waging battle against the Shana Rei. But in their mission to win, they almost go too far, as their newest most deadly weapon very nearly terminates them as well. The way Anderson takes a lone flicker in his imagination and creates a living breathing alternate universe is truly compelling; in the end, Cosmos is certainly destined for the same widespread acclaim its predecessor enjoyed. THE IRON ASSASSIN. Ed Greenwood. Tor. Greenwood is the creator of the Forgotten Realms fantasy game and he puts his on-the-edge imagination on full display in Iron Assassin. Here, in London (capitol of the Empire of The Lion), Queen Victoria never was and the earth is no longer our own. Here, cities are riddled with filth and murderers threaten to obliterate the hierarchy of the crown. In the end, it’s all up to the young inventor Jack Straker and his clockwork-enhanced corpse to save us. 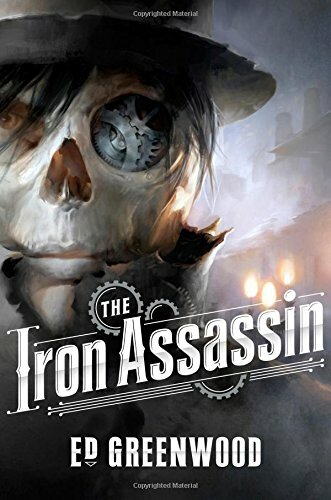 Greenwood’s writing in Iron Assassin is masterful – taking pieces of reality and molding them into a new pair of eyes that end no less real than the plot of land on which each of us stands. Make no mistake – this is fantasy writing at its finest. This entry was posted on May 28, 2015 by Jacob Aiello in 2015, 2015, June 2015, Snapshots On Fiction and tagged Book Review, Books, Forge Books, Tor Books.